The crowdsourcing model (csm) specification provides a vocabulary to capture, store, and analyze crowdsourcing data. The specification is expressed in the Web Ontology Language (OWL). 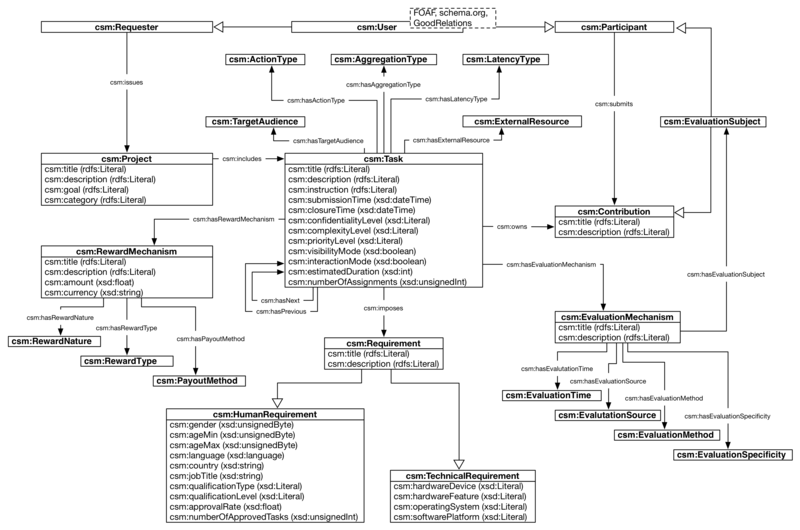 The current version of the ontology (draft 0.2) includes 24 classes as well as 22 object and 30 unique datatype properties to describe the key aspects of a crowdsourcing activity (see figure). A description of all potentially usable concepts, relations, and attributes that are identified for the enterprise crowdsourcing domain can be found in the data dictionary or in the CSM ontology specification.